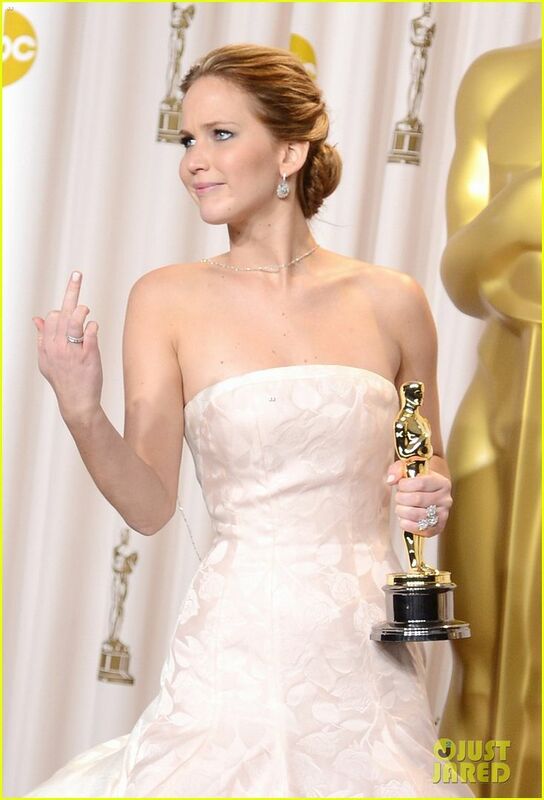 And just like that, Jennifer Lawrence is immortalized -- goofily! -- in Oscar history. 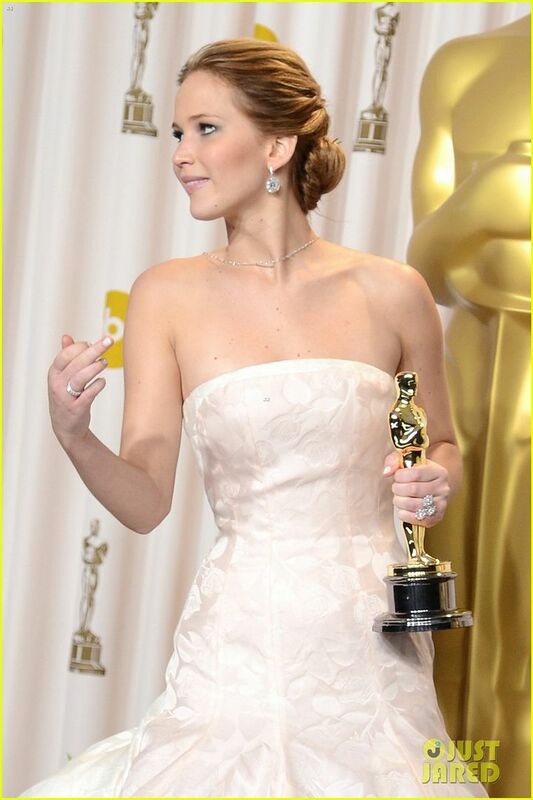 The 22-year-old star won the Best Actress Academy Award inside the Dolby Theater in Hollywood on Feb. 24. 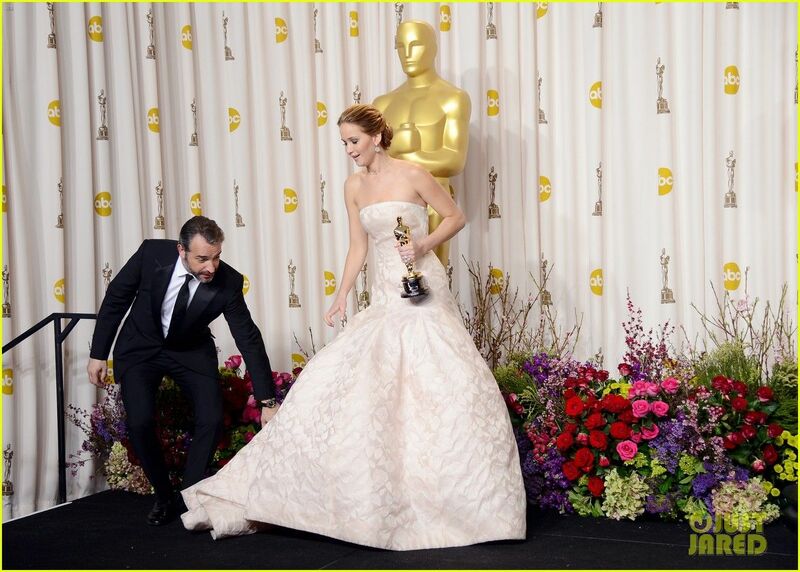 Ascending the Oscars stage in a stunning pale Dior Haute Couture gown, Lawrence suffered every actress' nightmare: She face-planted! Tripping on her sizable frock, the blonde fell down on the steps, and was quickly helped up. Getting a standing ovation from some in the crowd, Lawrence quickly acknowledged the pratfall. "You guys are just standing up because you feel bad that I fell -- it's really embarrassing. This is nuts!" Accepting her Oscar from The Artist's Jean Dujardin, Lawrence then acknowledged her competition: Zero Dark Thirty's Jessica Chastain, The Impossible's Naomi Watts, Amour's Emmanuelle Riva, and Beasts of the Southern Wild's Quvenzhane Wallis. "You were so magnificent, and it's been so amazing getting to know you," Lawrence said, "You've made this experience unforgettable." Thanking her family and other colleagues, she then wished a happy birthday to French actress Riva, whose 86th birthday fell on Oscar Sunday.